Time to put away the kiddie pools, wrap up the grills, and say goodbye to my nice new deck! The leaves have been falling and though I feel like I got jipped from Summer this year, spending half of it pregnant or miserable, I’m ready for Fall! Well I shouldn’t speak too soon, here in New England we had two 90 degree days this week!! Though I love my grilling time, I’m ready to pull out the crock pots, get those soup and stew recipes out and cook up some yummy Fall dishes. I can NOT wait to share with you what the #SundaySupper crew has brought to the table this week! Who doesn’t love putting together a nice simmering soup on a cool crisp day, or how about using those fresh apples and pumpkins to bake your favorite dessert? Well you’ve come to the right place so go get your notebooks, pens and pour yourself a cup of piping coffee, or if your anything like me, a glass of wine on a nice cool Sunday evening and start writing down the recipes you’d like to try this season! This fabulous event is being hosted by Soni from Soni’s Food. Stop over and say hello to her! I’ll start you off with a dish I put together last Fall. I know I can’t believe it’s taken me a full year to get this out to all of you! Here is the kicker about this awesome dish, well there are two awesome, unbelievable things about it. One, it’s a one pot meal, meaning all you need for your dinner is made in one dish. Two, it’s made in the microwave! YES! The microwave! I was a little skeptical about it however when I bought this new dish I had to try one of the recipes that it came with…..I made it on a night that we were busy so it was quick and simple, I was totally amazed at how creamy and good it was for cooking in the microwave! Don’t doubt me, I’ve never let you down have I? Give it a shot, I actually just bought the ingredients to make again for my family this week. 2 cups of cooked chicken, diced (I make chicken in the crock almost weekly for quick and easy recipes! or it’s a good recipe to make when you have leftover chicken from another night. Combine cranberries and water in a dish and set aside. Combine onion, rice and oil in a microwavable casserole dish and stir to combine. Microwave, UNCOVERED on HIGH for 2-4 minutes, or until onion is translucent. Add broth, wine, sat and pepper and microwave, COVERED on HIGH for 13 minutes or until rice is slightly firm, stirring once halfway through. Drain cranberries, set aside.Remove dish from microwave (be very careful) Add chicken and celery, stir and microwave, COVERED on HIGH for 3-5 minutes or until rice is tender and risotto appears creamy. Remove dish from microwave again and add blocks of cream cheese and almonds. Stir until cheese is fully incorporated. Fold in cranberries, garnish with parsley if desired. NOW………..go get your pen and paper ready to take notes of these Fall dishes, or if your with today’s time start pinning! This sounds delish! Love the punch of sweet cranberries in this. Oh my! This is like a chicken salad wrapped in a warm quilt on a cold day. Love the combination with the risotto! Oh my yum! The perfect Fall dish!! Yum, this sounds so delicious. I love the addition of cranberries. Last time I made risotto, my shoulder was so sore the next day from all the stirring. I can’t believe this was made in the microwave! I love the flavors in this dish AND risotto in less than 30 minutes?! Amazing! 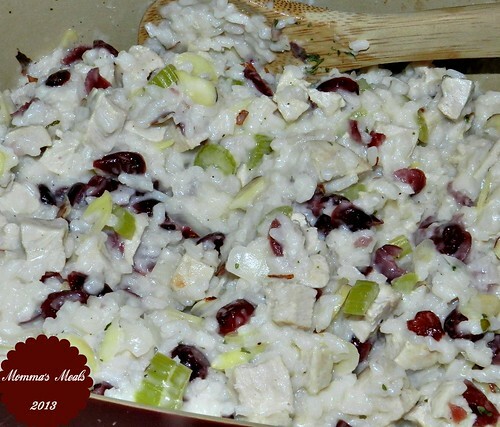 I have not made risotto in eons….and your cranberry chicken version is SO tempting! I love your salad! It looks just wonderful!! Great combination of flavors! What a perfect Side Dish! This just might hit our tables for Thanksgiving this year! This is a perfect fall dish! It looks great! Thanks for sharing! 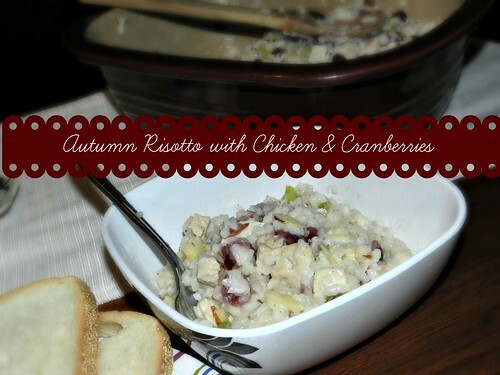 I love cooking with cranberries in the fall, and a risoto sounds perfect! I need to get over my irrational fear of making risotta so that I can try this. Your dish looks amazing and this mix of ingredients/flavours/textures is perfect for fall. I love rice recipes that combine sweet and savory! This one looks amazing–and it’s a microwave quickie! 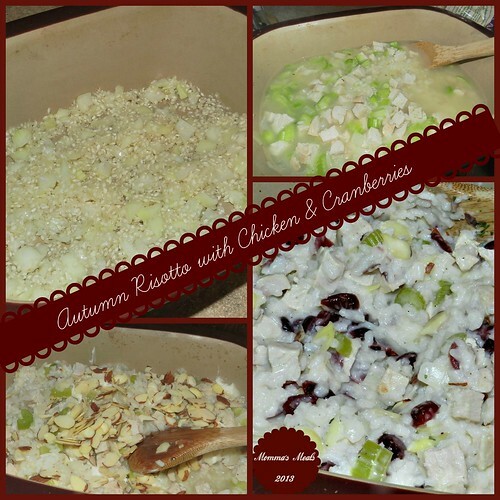 Great minds think alike – I always think of risotto in fall too!